Home › Electronics › Selfie Stick Bluetooth For Iphone 7 Iphone 7 Plus Iphone 6S Iphone 6S Plus An..
Selfie Stick Bluetooth For Iphone 7 Iphone 7 Plus Iphone 6S Iphone 6S Plus An..
32" Max Length A 32 inch maximum length allows you to take a self photograph or group photos easily with a simple length adjustment. 270-degree adjustable head ensure you to find the best & beautiful angle when taking your selfies. Special U-shape Silicon Clamp Locks Phone in - 100% Safe and Reliable. 5 STAR GUARANTEE: If for any reason you are not madly in love with this selfie stick, contact the Trusted Products Guarantee Department and you'll receive a 100% money back refund or free replacement! 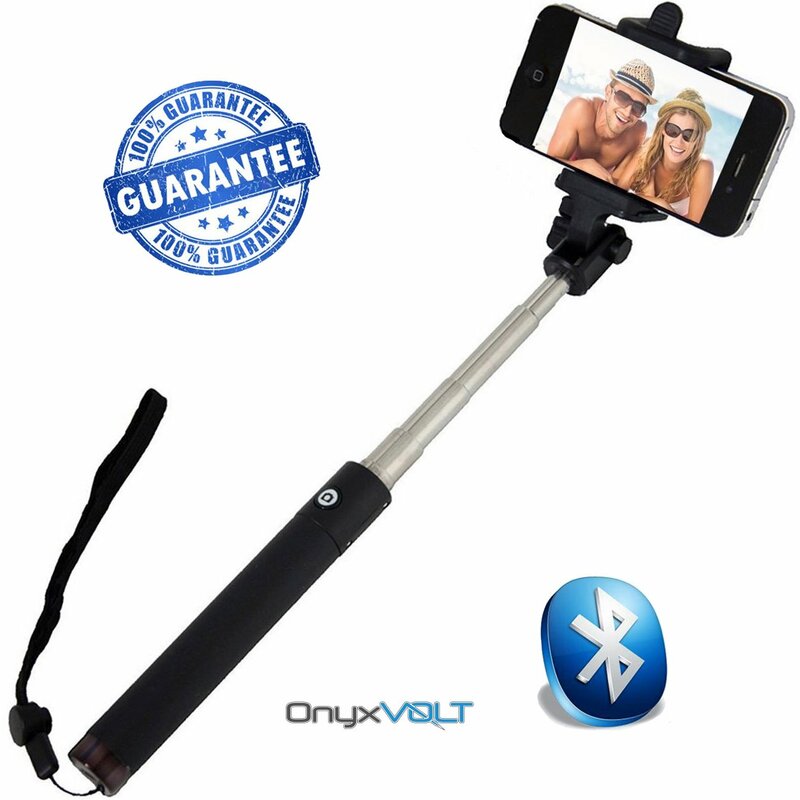 [New 2016 Model] OnyxVolt™ Wireless BlueTooth Selfie Stick - The Most PopularSelfie Stick on Amazon! - This 2016 Model is the most Compact and ComfortableSelfie Stick Yet! Foldable & Portable design fits your pocket or bagperfectly. - Designed to make it easier to take selfies of you and yourfriends. It's Bluetooth, hassle free. Works with nearly any phone on themarket.Works Great With: -iPhone 7, 7 Plus, 6, 6 Plus, 5s, 5c, 5, 4s, 4, 3gs-Samsung Galaxy S7, S7 Edge, S6, S5, S4, Active, S3, S2, Note 4, Note 3, Note2, Note -HTC 10, One, M8, M7 -LG V20, V10, G5, G4, G3, Realm, Vista, Red-Nokia Lumia 830, 735, 635, 520 -Amazon Fire Phone -Other smart phonesSpecifications-Weight: 5 Ounces -Length: Up to 31.5 inches -Phone Holder Clip:4" to 6"inch Perfect for: -Traveling -Video Diaries -Video Blogging-Hiking/Camping -Weddings -Parties -Beaches -Concerts Lifetime Guarantee: -5STAR GUARANTEE: If for any reason you are not madly in love with this selfiestick, contact the OnyxVolt Guarantee Department and you’ll receive a 100%money back refund or free replacement! You Have Nothing to Lose and The BestSelfies to Gain! Scroll Up to the Top & “Add To Cartâ€ to Start Taking YourBest Selfies Yet!